UPDATED: Wed., July 11, 2018, 5:21 p.m.
PLYMOUTH, Ind. – An alligator that was hanging out in a northern Indiana retention pond has been captured after being lured to shore with a frog. 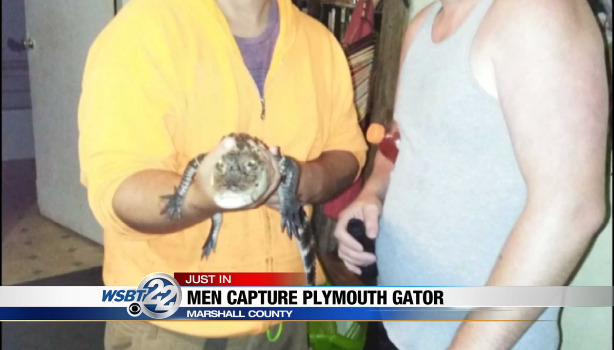 Brandon Crawford of Goshen told WSBT-TV that he and a friend captured the reptile about 3 a.m. Wednesday and turned it over to police in Plymouth, about 20 miles south of South Bend. Crawford said he’s from Texas, where gator hunting isn’t unusual. WNDU-TV reported the alligator is 2 to 3 feet long, and may have been a pet. The reptiles are usually found in the wild in southeastern states and can grow to 13 feet. Teenage boys fishing at the pond earlier this week said the alligator tried to eat their bait. Residents flocked to the pond to see “Ali” the alligator. Published: July 11, 2018, 11:39 a.m. Updated: July 11, 2018, 5:21 p.m.